Use PROMO CODE ALISTHUB25 to get a 15% discount off your purchased tickets! Click here for 15% OFF tickets! Have you been thinking a lot about change lately – how we can change ourselves, our communities, and our world for the better. 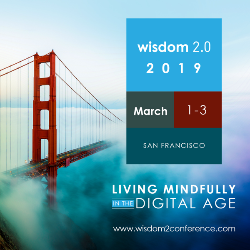 At Wisdom 2.0 this year, you’ll be discussing consciousness, the sacred, and focusing on the importance of connecting in person in an increasingly digital world. Join CEO of the Obama Foundation David Simas; meditation teacher Jack Kornfield (Path of Heart); renowned marriage researcher and expert Dr. John Gottman of the Gottman Institute; author and activist Michael Pollan (How to Change Your Mind: What the New Science of Psychedelics Teaches Us About Consciousness,); and many, many others at Wisdom 2.0 2019. View a full list of speakers here. This annual event, celebrating its tenth year, will bring together 3,000+ people from 30+ countries to explore the intersection of wisdom and technology. If you can’t join in person, the Main Stage will be live-streamed for free at www.wisdom2conference.com! There will also be breakout sessions, community conversations, an embodiment lounge, community dinners. Featured in the New York Times, Wired, Fast Company, Huffington Post, Financial Times, Forbes and many other business magazines, the Wisdom 2.0 Summit has sparked an ardent discussion in Silicon Valley, New York business circles, and in communities around the globe of the value of mindfulness in our high-speed, interconnected age. Join Byron Katie, Jack Kornfield, Roshi Joan Halifax, Dan Siegel, Michelle Gale, Louie Schwartzberg, Dr. Julie Schwartz Gottman, Dr. John Gottman, Konda Mason, Richard Strozzi-Heckler, Karen May, Diego Perez, Spring Washam, Paul Hawken, Tami Simon along with leaders from business and technology, to explore living wisely in the modern age.